Ah yes The Roc, we go way back don't we? 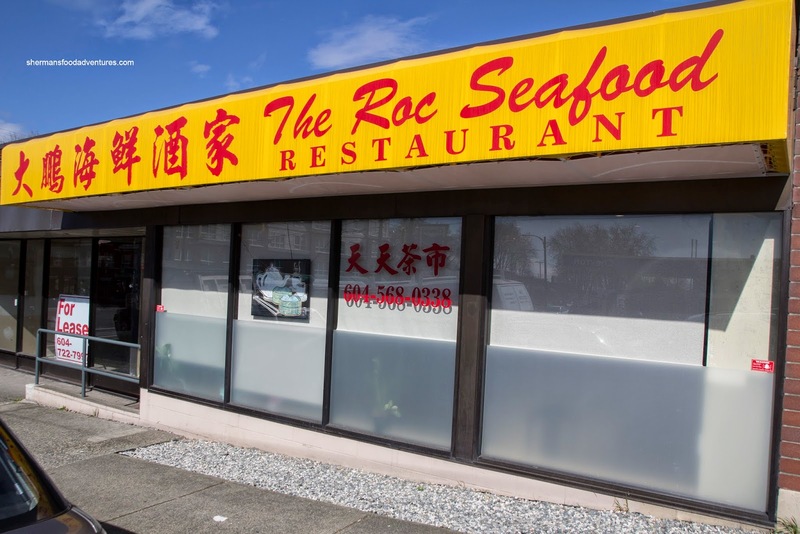 From your very first location on Kingsway at King Ed to further up Kingsway near Knight, we've tracked you down. Then we found you all way down at Cambie at Marine only to be displaced by the Canada Line. You settled into your current spot on 41st at Main almost 2 years ago and have stayed there ever since. Yah, and you thought nomads moved around lots. Well, my admiration at your tenacity and determination to continue on keeps me coming back. Not the best Chinese food in town, but consistently one of the best values around. 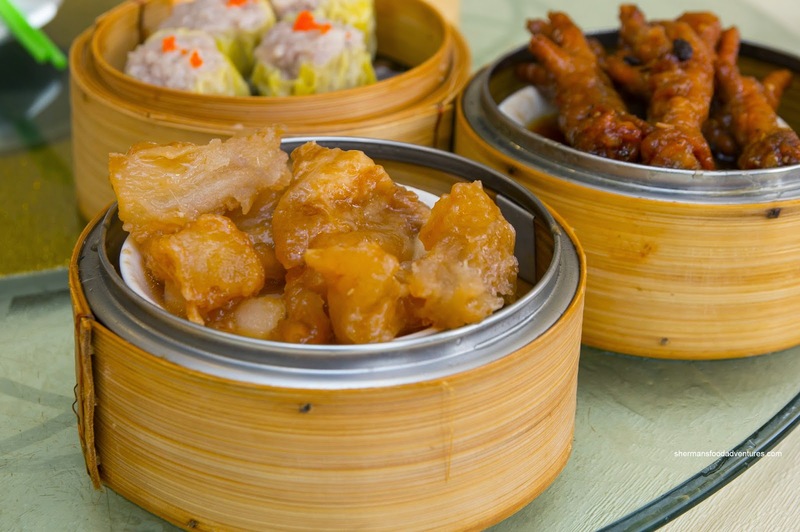 Having visited them when they first settled in, we returned to try many more dishes than the last time. We began with 2 similarly flavoured items which were quite different in terms of the main ingredient. 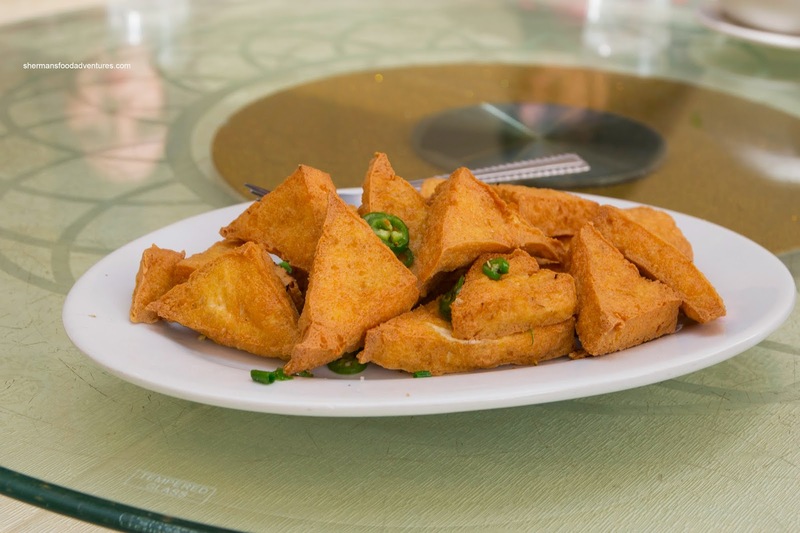 Starting with the vegetarian item, we had the Fried Tofu which was tossed in green onion, chili peppers, garlic, pepper and salt. This was well-done with crispy tofu that still had some silkiness inside. The wok toss yielded some flavour and impact, but it was not totally apparent either. 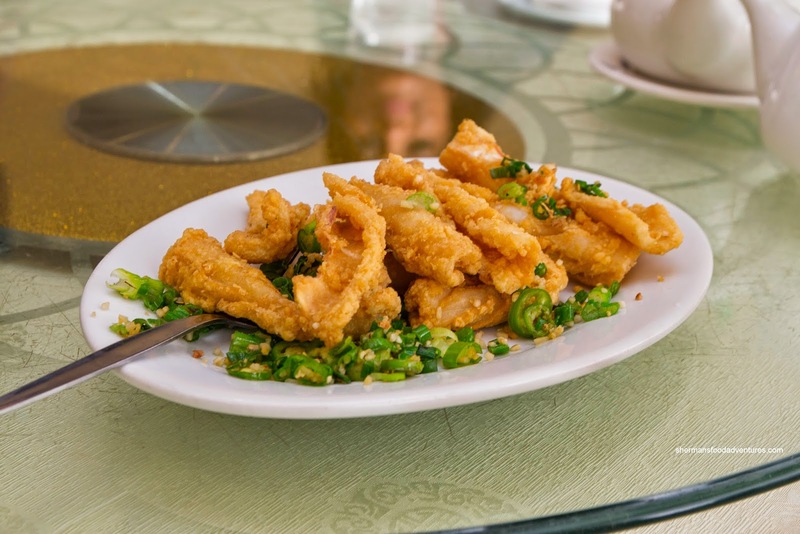 As for the Fried Squid, it was tossed in the exact same manner, yet retained more of the spices. This was probably due to the exterior batter (and residual grease) that the flavour could adhere to. Lightly crispy on the outside (while a touch bready), the squid was tender with a slight bouncy chew. Moseying onto some feet, we had both the Phoenix Talons (Chicken Feet) and Duck Webs. Not sure why we were told by our grandparents that eating these things we'd run faster... Wouldn't we just gain wait and have high blood pressure from over consumption? That would slow us down!!! 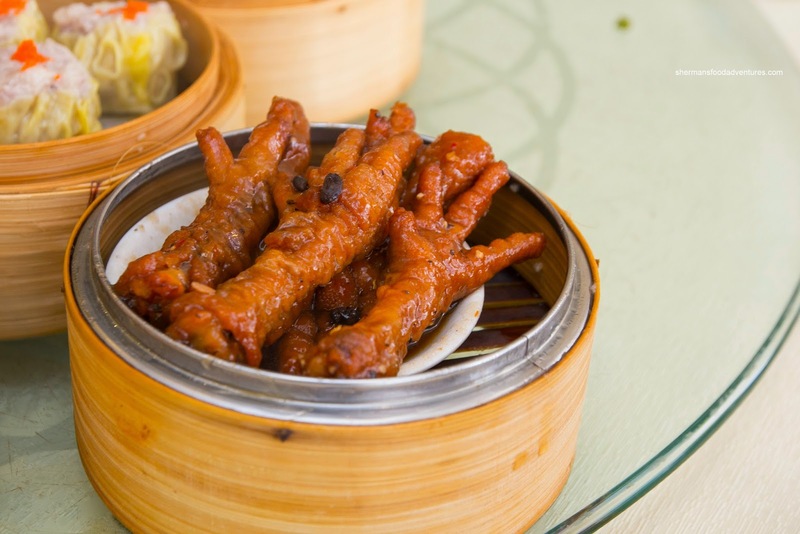 Anyways, we found the chicken feet to be properly prepared where the exterior skin stayed intact. Inside, the cartilage was soft while not melted down. These were nicely plump and well-seasoned with garlic and a good balance of savoury and sweet. Equally well-made were the duck webs as the they were buttery soft while not mushy. The slight rebound of the cartilage and fat underneath added to the overall texture. 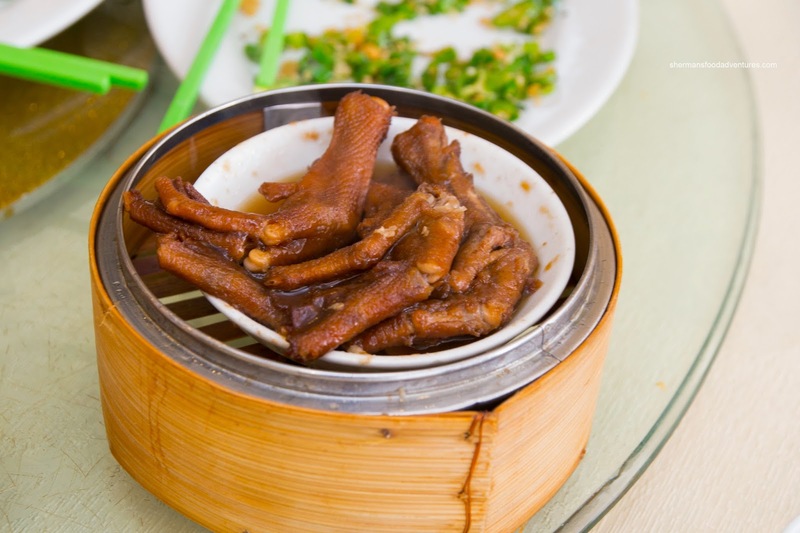 These were also properly seasoned such as the chicken feet. With no tripe available, we went for the next best thing being the Steamed Beef Tendon. Interestingly, this was a contrast in textures with each individual piece all in the same dish. While one tendon would be super soft, there would be one that was almost crunchy. Mixed in between were some perfectly textured pieces. As for the colour, it was strangely pale, yet at the same time, it wasn't as if there wasn't any flavour either. I found it more sweet and garlicky than anything else. 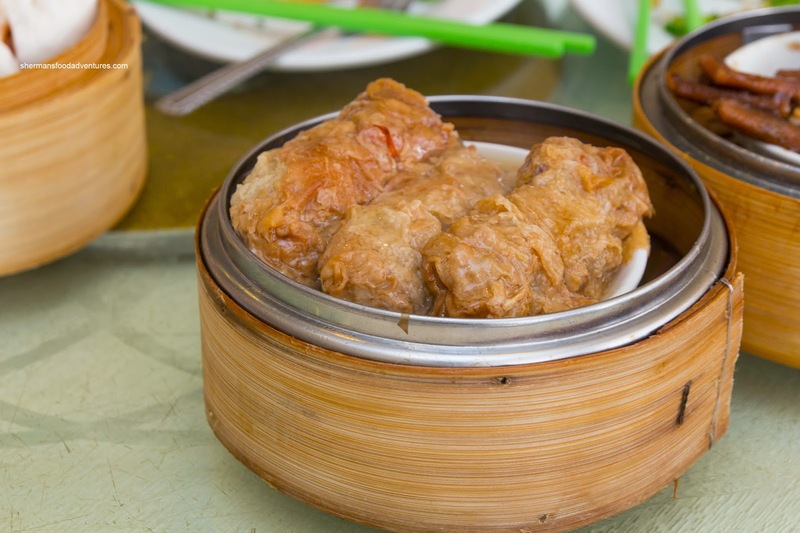 Onto something other than feet or tendon, we had the Bean Curd Skin Rolls. These were decent with a soft exterior skin that still maintain a chew. Inside, the pork filling was moist while not devoid of texture. The dish itself was mildly seasoned where there wasn't an overload of sauce. 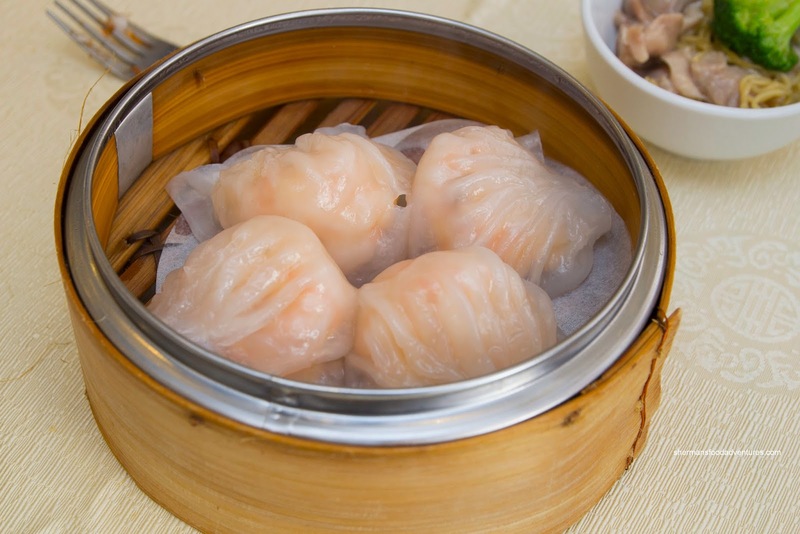 As per usual, we had both the Haw Gow (Shrimp Dumpling) and Sui Mai (Pork & Shrimp Dumpling). Due in part to it's large size where each dumpling was crammed up against each other, the dumplings were stuck together. Hence, when we picked up one, they fell apart. Also, the dumplings might've been over-steamed a tad too which resulted in a wetter skin. However, the texture was okay being chewy while slightly thick. 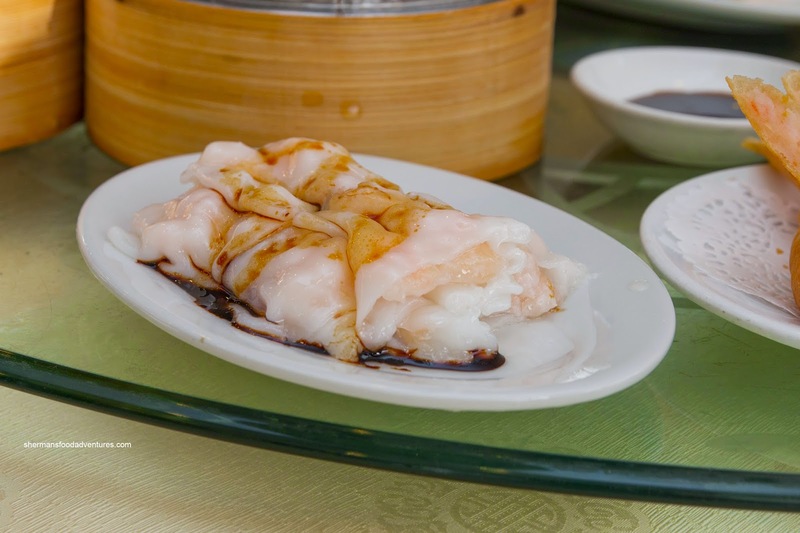 Inside, the shrimp filling had a buttery snap where it was seasoned properly with a touch of sesame oil. 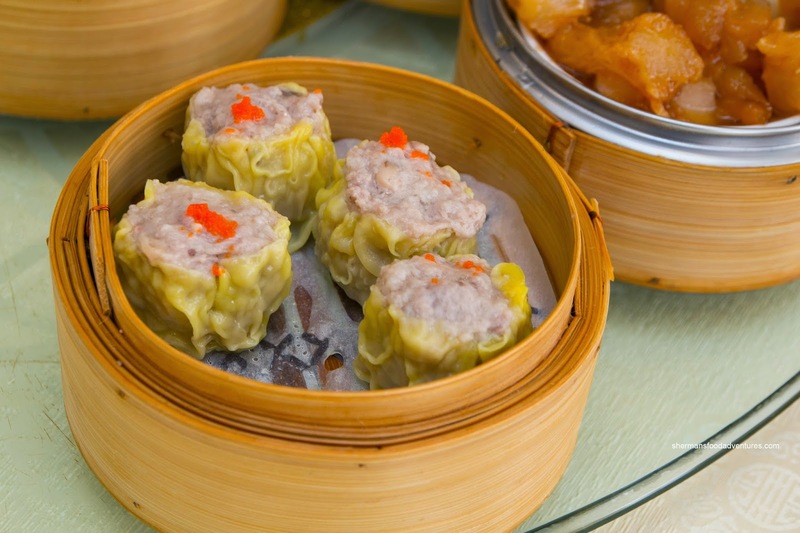 As for the sui mai, they were mainly comprised of pork with little to no shrimp nor shiitake. Hence, there was a definite pork flavour which was only intermittently interrupted by some bursts of sweetness and savoury elements. Texturally, they were on point though having a good rebound. 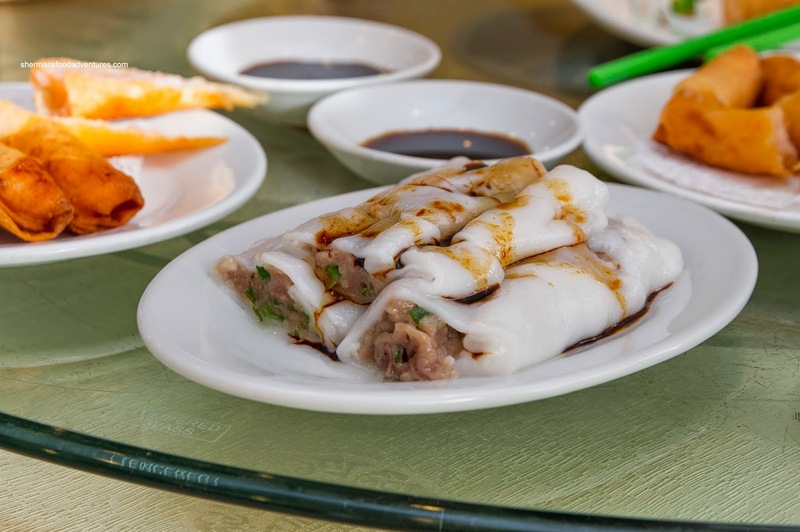 We ended up with 3 types of Rice Noodle Rolls including shrimp, beef and BBQ pork. All 3 exhibited the same qualities in terms of the rice noodle. It was slightly thick, but really soft and somewhat wet. Inside, the shrimp filling was similar to the haw gow where it had a moist snap while purposefully seasoned. The beef was also quite good with a buttery rebound texture with just the right amount of onion. However, the BBQ pork rice noodle roll had green onions as well. In our minds, this was not necessary as it didn't add anything to the dish. Other than a colour contrast, the green onion wasn't there to kill any fishiness and since it was steamed (and not wok tossed), there was no real aromatics. They should've left it out. Off to some carbs, we had the BBQ Pork Buns which were massive. So much so, they were sardined into the bamboo steamer where we had a hard time removing them. 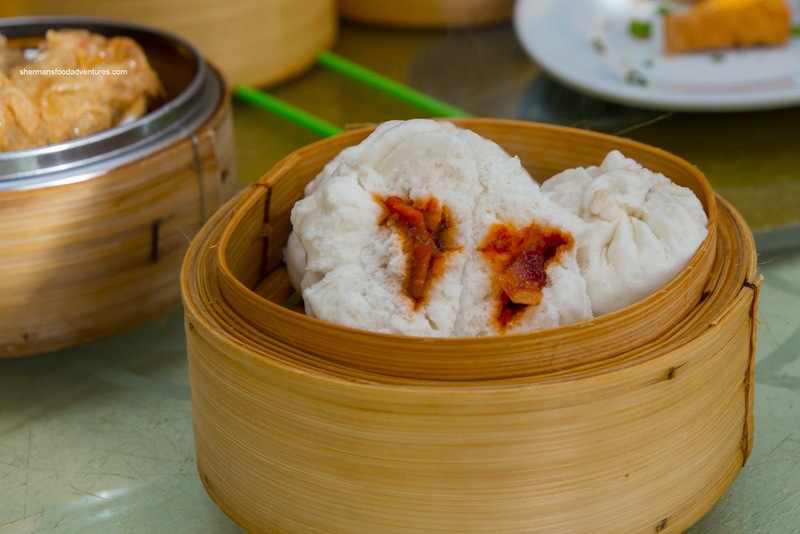 Once removed, the medium fluffy bun revealed plenty of lean slices of BBQ pork. There was only a modest amount of sweet glaze which meant the bun was on the drier side, but at the same time, it wasn't overly sweet either. 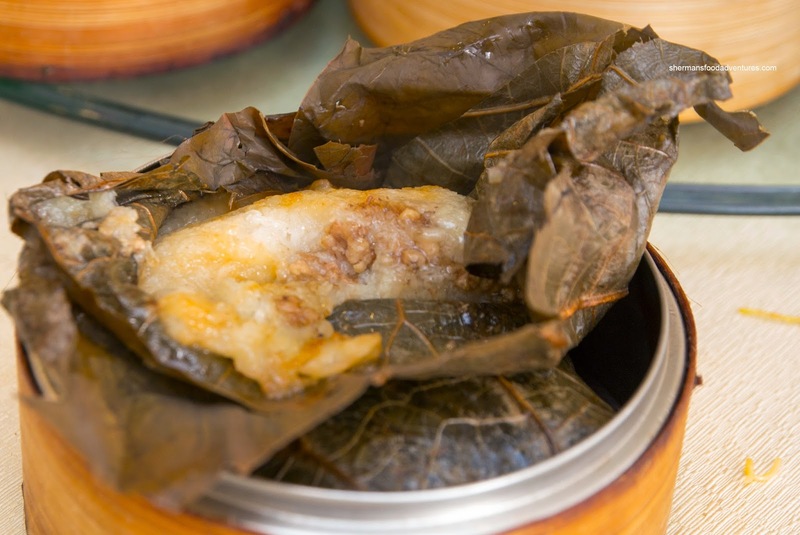 When I first laid eyes on the Lo Mei Gai (Sticky Rice), I was dismayed to only see 2 of them. Upon removing them from the steamer, it was quite obvious that I didn't realize that they were enormous and easily bigger than 3 mini versions. Inside, the rice was moist with plenty of glutinous texture while the amount of pork filling was sufficient providing the necessary flavours. 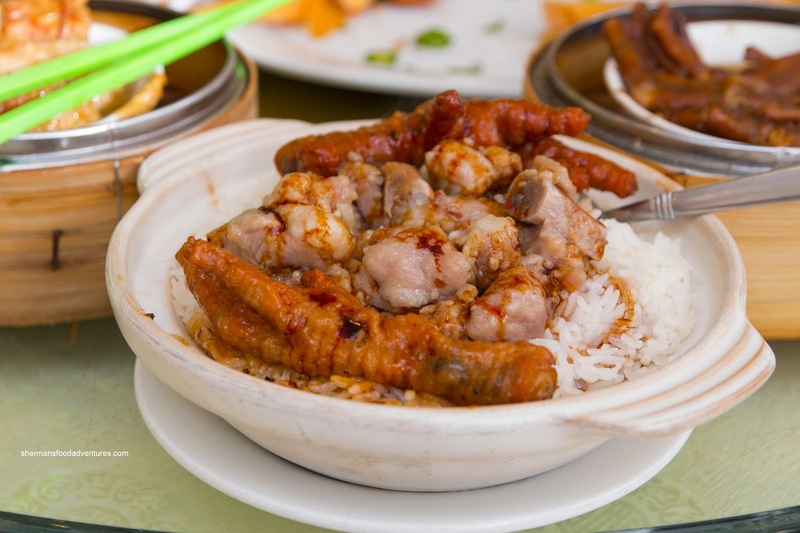 With another carb, we had the Pork Spare Rib Rice Hot Pot with even more chicken feet. Boy, we were gonna run even slower now! This was pretty good with chewy rice that was topped with meaty pieces of pork spare rib. 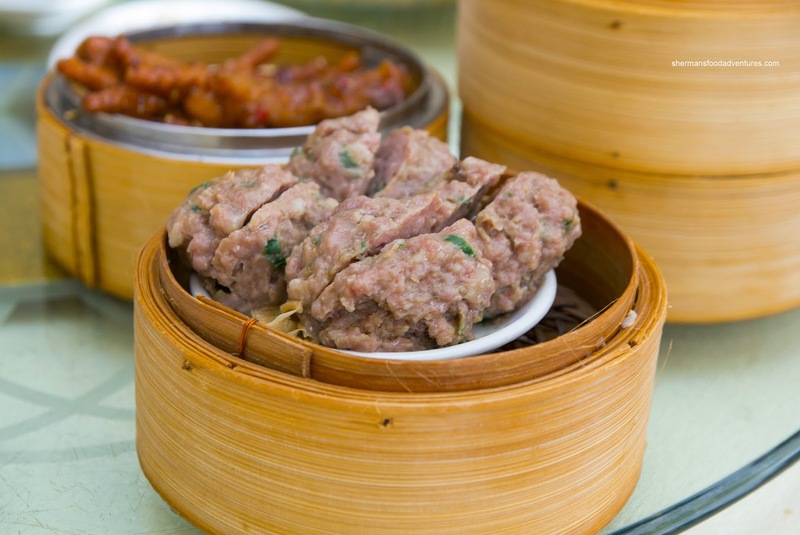 The texture of the meat had a firm rebound that was still ultimately easy to chew. They were well-seasoned with a bit of garlic, but no black bean. 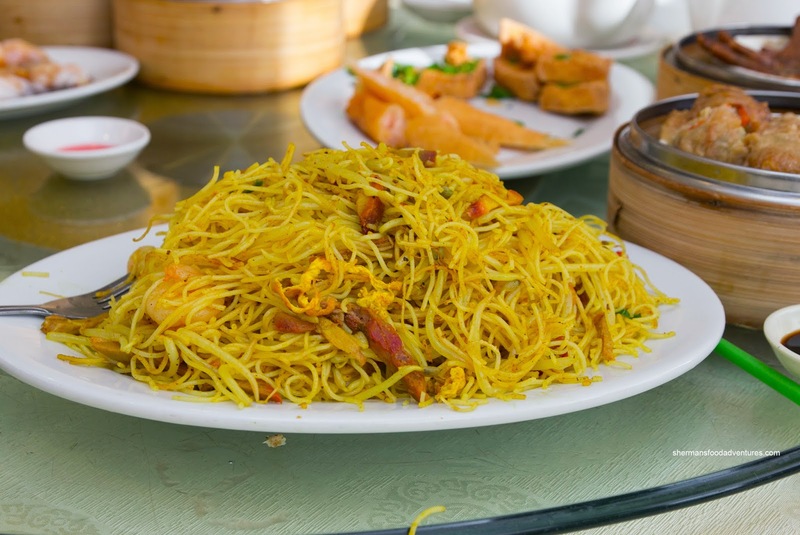 And the carbs didn't end there either... We had the Singapore Fried Vermicelli next which looked harmless at first glance. With each bite though, the flavours became spicier and spicier. It wasn't super hot, but the heat definitely lingered. We liked the chewy texture of the noodles, but were disappointed by the lack of ingredients. For the shrimp we could find, they were cold-water crunchy. You'd think we'd stop with the carbs right? 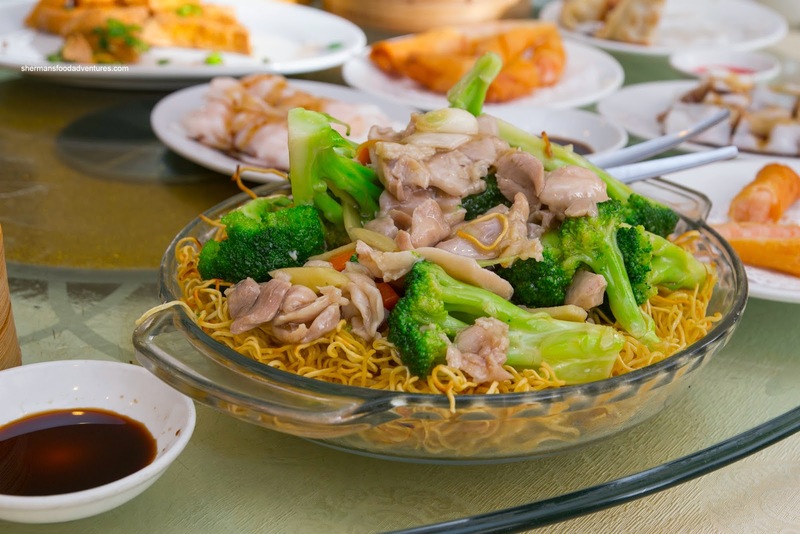 Nope, we went ahead and got the Chicken Chow Mein as well with crunchy fried noodles. This was an okay dish and we should've known that from the start. I much prefer the house special or seafood chow mein personally. The noodles were crunchy to start, but the plethora of sauce ensured that they softened pretty quickly. The flavours were mild while the chicken was properly tenderized. 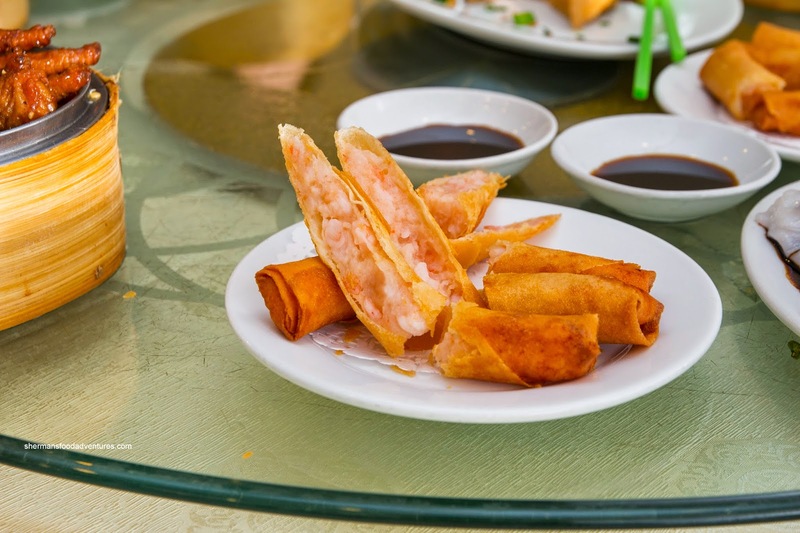 We couldn't forget about the Shrimp Spring Rolls right? Although my son wasn't present, it is almost like a reflex action that I ordered it. Good thing too as they were good with a crunchy, non-greasy exterior with the same snap-textured shrimp that was well-seasoned. Our final 2 dishes consisted of the Beef Meatballs and Potstickers. I found the meatballs to be over-tenderized where there was no actual meat texture left. They were almost fluffy and airy which didn't really work for us. Flavour-wise, it was mildly seasoned with a decent amount of green onion. 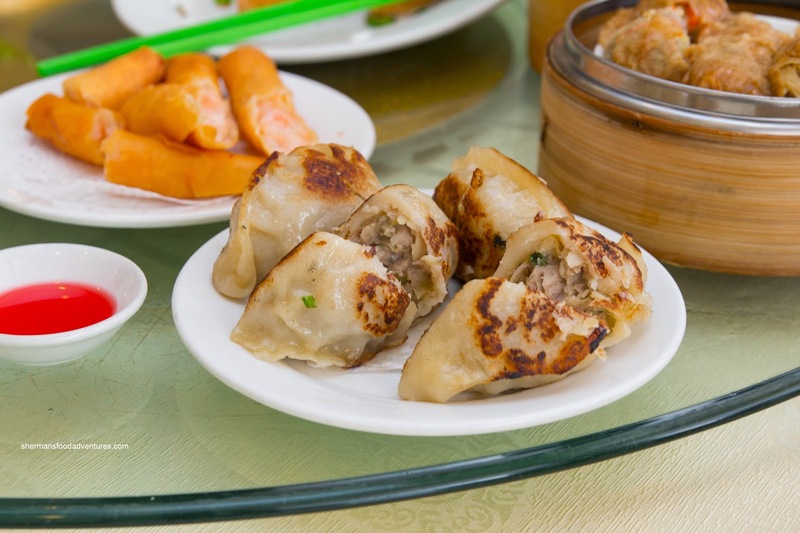 As for the Potstickers, they were big and plump where the pork filling was pretty substantial. It was moist and soft while the exterior skin was not overly thick. It was greasy though. And at this point we got a gazillion take-out boxes because there was no way we could finish all the dishes we had ordered. On the positive side, it gave us a clear picture of their Dim Sum service - decent while not spectacular. For the price, we felt it was still a good value and definitely an option when you don't need anything fancy. Food here is solid. My parents go there roughly every week. They have this gai lan special at lunch ($4 ?) that's really good and fresh. But yeah, feels small inside and gets pretty loud .... I don't prefer to eat there due to that.